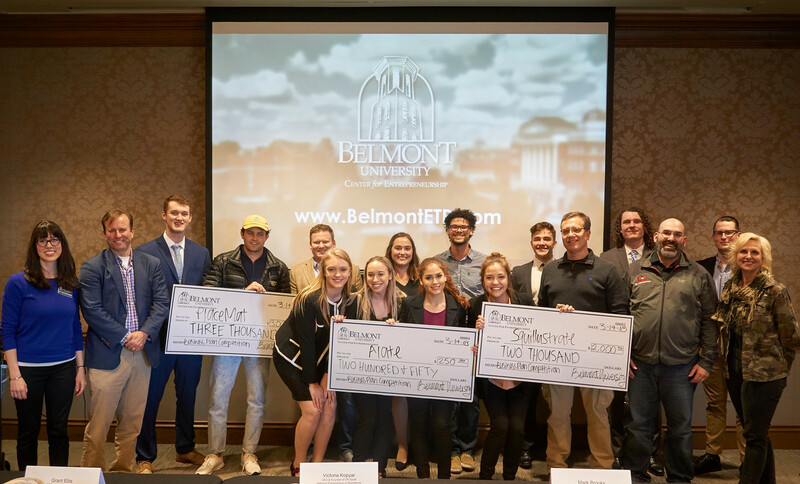 The Center for Entrepreneurship hosted its annual Business Plan Competition last week, allowing nine student businesses to compete for cash prizes in front of a panel of judges. Ryan Reisdorf took home first place with his business PlaceMat, a wholesome, farm-to-table catering service. The second and third place prizes went to Suzanna Stapler’s Squillustrate and Sarah Beth Perry’s With the Band. Additionally, Karyme Meixueiro Cravioto and Emily Knapp won the People’s Choice Award with their business, Alate. Competition judges included Kevin Roddey, senior vice president of Pinnacle Financial, Scott Rouse, entrepreneur and body language expert, Victoria Kopyar, CEO and founder of VK Sport and Belmont Entrepreneur in Residence, Shawn Glinter, CEO and founder of Pendant Biosciences, Inc. and Belmont entrepreneur in residence, Grant Ellis, CEO of Nut Butter Nation and Mark Brooks, Senior Vice President of First Advantage Bank.